Many of you will have seen the excellent pieces in The Guardian over Christmas highlighting the importance of legal aid. This included an article where Nigel Evans, a Conservative MP, described how his experiences of the criminal justice system and spending his life’s savings on legal fees had changed his views on the legal aid cuts. Once he saw the rough end of austerity justice, he realised LASPO had gone too far. We need more MPs to appreciate the devastating effects of LASPO. Therefore, we are looking for YLALs to take their MPs to work so that they can see first-hand why a properly resourced legal aid scheme is essential. This will be an inclusive, cross-country, cross-party campaign and a continuation of our work with More United. Together, we ran a letter writing campaign where thousands of people wrote to their MPs asking them to speak up for legal aid in a well-attended Westminster Hall Debate that we organised with cross-party support. Now we need to keep up the momentum! Eye opening visit to Thames Mags. 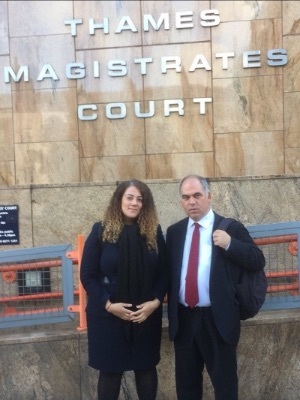 Court to see the criminal justice system in action with @daniellejmanson who only received her papers at 7.43am! I observed a court ill equipped to deal with a defendant in a wheelchair, an unrepresented man plead guilty and other shortcomings. What does taking MPs to work involve? Each participating YLAL will show interested local MPs a snapshot of life as a legal aid lawyer, be it helping individuals to navigate their transition on to Universal Credit, working with people on the brink of losing their homes at a housing duty scheme or representing young people in a Magistrates’ Court. The campaign will show the vitally important work that YLALs do and highlight some of the problems LASPO has caused. Participating YLALs may work in any area of legal aid or in an area that was taken out of scope by LASPO. The more diverse the range of work shown, the better! Not only will this campaign educate MPs but it will provide an opportunity to publicise what is happening on the ground and build public support for a properly resourced legal aid scheme. We will work with YLALs and MPs to create video diaries, press pieces and blogs to share on social media. We will provide you with all the support that you need, including connecting you with MPs, planning the format of your session (which could last from half an hour to a day) and publicity. We will make sure that the session works for you and is not too burdensome! You may be interested to read a previous briefing on how to meet your MP we prepared to get an idea of what it can involve. If you'd like to get involved, please fill in our survey of interest here by 5pm Wednesday 6 February 2019. This is only an expression of interest and not a cast-iron commitment, so if you are keen but not sure that you can be involved, fill out the form anyway! Once we know that you are interested, we can explore further. If you have any questions or would like to discuss any aspect of the campaign, please contact YLAL Campaigns.